TrekFit™ – was born on the eve of the perceived new millennium (2000) atop Blood Mountain, Georgia. Driven by our desires to enjoy weekend with nature, we hiked up the Appalachian Trail towards the Blood Mountain summit. It was a night of tornadic activity where our fear for the world to end was out of sight, yet the wondering presence to be airborne by nightfall was gravitating our urge to get a good night sleep, as if it was our last. Waking up to the new millennium with an airplane sound made us realize that contrary to what others have feared for the world to end, TrekFit was alive and well! For so many years, TrekFit™ presence at Blood Mountain was manifested by the memories of nature’s crisp air where efforts to keep the stillness and natural wonder of the mountain trails were evident by upholding the rules of nature to leave no trace behind. And so, determined by the dream to make TrekFit™ the landmark of health and fitness, we continued to build its foundation piece by piece so that one day, a perfect program will be borne to leave a healthy living legacy for mankind. TrekFit™ was online for several years where many have benefited from the nutrition information posted. Students from far away places have written us to acknowledge such benefits. Several years have passed, but TrekFit™ remained steadfast in preparing for a full scale program in order to serve the public at large. The Georgia Mountain is the northeast corner of the State of Georgia which spreads in a westerly direction. The mountains in this region are in the Blue Ridge mountain chain that ends in Georgia. According to reports that at over 1 billion years of age, the Blue Ridge mountains are among the oldest mountains in the United States. These mountains were believed to be the oldest mountains in the world. These mountains are part of the vast system Appalachian Mountains that spans longitudally along the eastern areas of the United States and ends in Alabama. The region is known for its ruggedness and scenic beauty where its original dwellers were the Cherokee Indian. It is where the more than 750,000 acres of the Chattahooche National Forest is nestled quietly. Blood Mountain is the highest peak on Georgia’s portion of the Appalachian Trail and the State’s 6th highest mountain. It is located in Union County, near the town of Blairsville. The history of Blood Mountain has been told in many different fashion. It was said that its name can can be traced back as the sight of a battle between the Cherokee and Creek Tribes for control of territory. The battle was fought at Slaughter Gap located just between Blood Mountain and Slaughter Mountain. According to history, it was a tragic battle between tribes from which both places are called in its honor and commemoration. 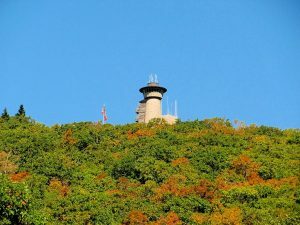 Another version of the story states that the name Blood Mountain represents the red lichens (a hardy primitive plant that grows in harsh conditions) or Catawba rhododendron growing on the rocky summit. The Blood Mountain Wilderness is the first designated wilderness area along the Appalachian Trail as the hiker’s initial approach from Georgia to Maine. 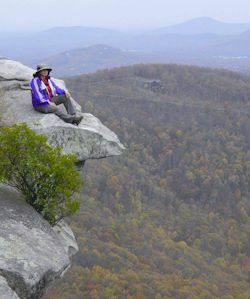 At 4,461 feet, it overlooks an area rich in streams, hiking trails, and scenic recreation spots, one of which Sosebee Cove is said to be probably Georgia’s only north-facing cove traversed by a paved road at such a high elevation. As hikers describe, it has a boulderfield, northern hardwoods, and large buckeyes and provides an example of how tulip poplar takes over following too-thorough logging of cove hardwood forests. Brasstown Bald Mountain is located in the Chattahoochee-Oconee National Forest and is the highest mountain in Georgia emerging its peak about half a mile above the surrounding valleys. Hikers trek up through the challenging Arkaquah Trail where unexpected fog, mist, and storms can move in and obscure the view at any time during the trek. 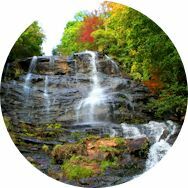 However, such weather conditions support the dashing plants and wildlife found on the forested slopes of Brasstown Bald Mountain. Hikers embark at the Track Rock Gap archaeological area, off Georgia Route 76. This route is located Northeast of Blairsville and 4 miles southwest of Young Harris which is three miles to where the trail begins. 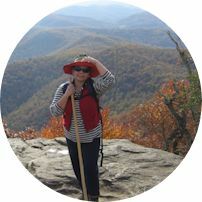 As one of the trip leaders of an outdoor club, I led/co-led trekking events to the Brasstown Bald summit. 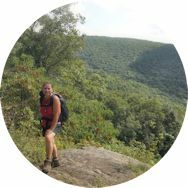 Beginning at Track Rock Gap (a former Cherokee Indian village), we climbed to Buzzard Roost Ridge, enduring the most difficult part of the hike as we gained the 1435 feet in elevation in only 1.7 miles. The hike involved an initial and significant climb with difficult switchbacks, ascending ridge lines, and trail descends, but the joy of seeing many beautiful open vistas of the north Georgia mountains made the trek so worthwhile. We then passed through Low Gap and to the summit of Chimney Top Mountain. After reaching the end of the Arkaquah Trail (at the Brasstown Bald parking lot), we climbed an additional 1000 feet to the top of Brasstown Bald. From there, we paused for our snack/lunch and then returned to Track Rock Gap. This is a strenuous hike, covering approximately 12 miles and including approximately 4000 feet in elevation gain. Only advanced hikers with D5 experience (or with significant D4 experience) can endure the challenge.